Cook Spinach in a little water in a medium saucepan until limp. Drain well, and then squeeze out excess water. Keep water drained, do not discard. Heat a few drops of oil in a non-stick pan and fry onions until golden. Remove from the heat and mix in the cottage cheese and spinach. Season with pepper. Spread evenly into an oven proof dish. Arrange the pilchard fillets on top. Cheese sauce: Melt Marg in a medium saucepan. 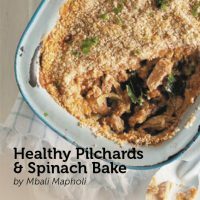 Remove from the heat and stir in flour, milk, mustard powder, and sauce from pilchards and water from spinach. Bring to the boil and cook, stirring, for about 2 minutes until the sauce is smooth and thick. Remove from the heat and mix in the cottage cheese. Season with pepper. Pour Cheese sauce over the pilchards and sprinkle with breadcrumbs on top, Bake, uncovered, for about 20 minutes until the topping is golden brown. Serve Hot. Pilchards are part of the oily fish family, they are packed with essential fatty acids: Omega 3 fatty acids. Omega 3 fatty acids may help us lower blood pressure, reduce bad fats in the blood, reduce risk of heart disease and stroke ad well slows the development of plaque in the arteries. The American heart association (AHA) recommends the intake fatty fish at least 2 – 3 x a week, other types of fatty fish include salmon, mackerel, herring, sardines and of course as mentioned pilchards. While foods are the best source of omega 3 fatty acids, supplements are available for those who dislike fish, do not meet the recommended amount of fish to eat a week or do not eat fish at all.